This summer I worked with Professor Mojica and researched the binding capacity of nanoceramics and sulfa antibiotics. This is a continuation of research we completed during the school year. For the summer, we chose to research sulfadiazine and sulfamethoxazole. We tested these antibiotics alongside four types of nano ceramics, titanium oxide, silicon oxide, magnesium oxides and zinc oxide. The purpose of the study was the observe if the absorbance of the antibiotics was altered after being exposed to each type of nanoceramic, which would allow us to conclude that binding had taken place. A shift was observed when both antibiotics were in presence of every nanoceramic, which allows us to conclude that both sulfadiazine and sulfamethizole bind with aluminum oxide, silicon oxide, titanium oxide, and zinc oxide. The type of interaction depends on each molecule and we have not yet studied how these may affect the structure of the antibiotic. 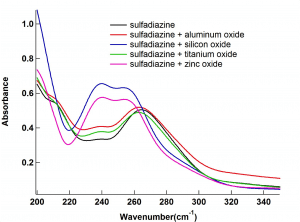 It is possible that new products form when sulfa drugs react with nanoceramics. We hope to continue this study into the next school year in hopes of finding out more about these interactions. This summer I am working with Professor Mojica to continue my study regarding the binding capacity of nanoceramics and sulfa antibiotics. We have been working on this project since the 2017-2018 school year and I presented my research at the ACS 2018 meeting in New Orleans. This summer, we intend to expand this project by testing two new sulfa antibiotics with the ultimate goal of presenting research at the August 2018 ACS meeting in Boston. The basis of the issue of this project is the fact that there is an abundance of antibiotics in the water system. This is due to many factors. Some of these include human waste, agricultural runoff, and aquaculture. This is a fairly new issue and so far no studies have shown any harmful effects to humans. However, scientists suspect that sensitive groups including pregnant woman could be at risk. There have been some negative effects on fish populations. The antibiotics have caused larger percentages of hermaphrodite fish to appear in recent generations. Modern water cleaning methods don’t remove most of these antibiotics. This project intends to look at how nanoceramics can bind to certain antibiotics, in order to change their absorbance or possibly even their structure. If the binding reacts in a way that makes the antibiotics less harmful to the water system, then this method could theoretically be used to more efficiently treat water. 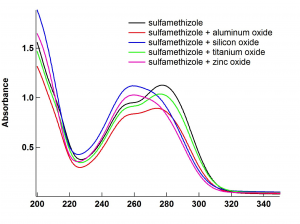 In this study we are testing four types of nanoceramics, titanium oxide, silicon oxide, magnesium oxide, and zinc oxide. Nanomaterials are extremely small particles that have at least one dimension less than 100 nanometers. These materials usually take on unique properties. In this experiment, we will explore their ability to bind to different sulfa antibiotics. Sulfa antibiotics are antibiotics containing sulfonamides. The sulfa antibiotics being tested in our study are sulfadiazine and sulfamethizole. 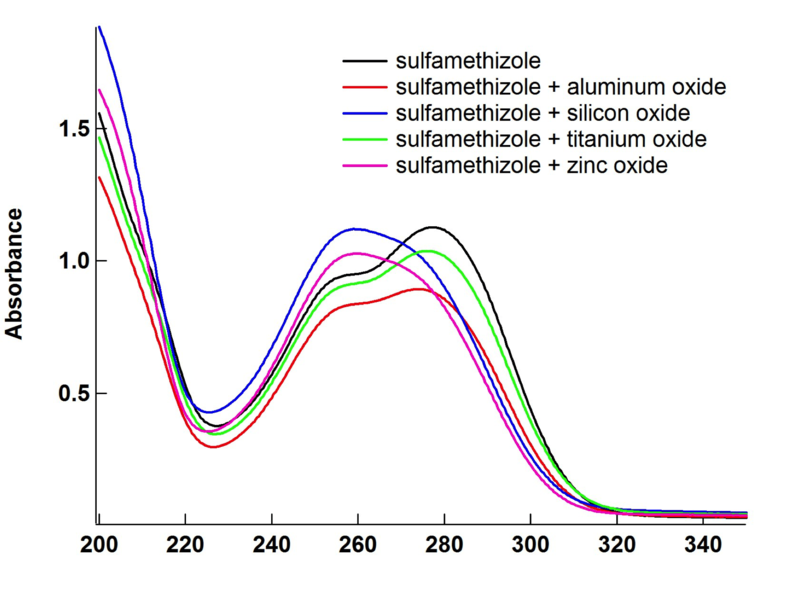 In terms of our methods, we will be following the same methodology that we used during the school year in which we tested sulfamethoxazole and sulfamethazine against the same nanomaterials. We will begin by creating a 10ppm mixture of both antibiotics in water. We will then add 1mg of the four nano ceramics to antibiotics samples of 2mL and give them an hour to bind. After filtering these solutions, we will run them through a high performance layer chromatography machine to test for peak area reduction. We will run these through the HPLC machine with a mixture of 95% water 5% acetonitrile. We will then run these samples through a UV-vis machine in order to test for absorbance change. We are looking forward to seeing the effects of these interactions over the next few weeks.